Amko Foods manufacture a range of traditional recipe’s, made using the finest ingredients, without the use of any artificial flavourings or additives, they are quick and easy to use, tailored for today’s busy lifestyle. 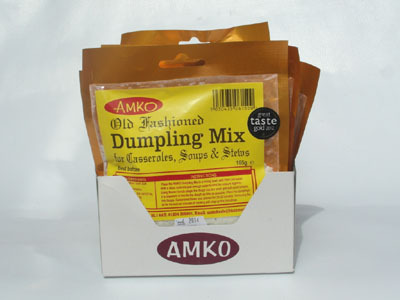 Amko Dumpling Mix – Gold (1 star) Award winner at the Great Taste Awards 2012, (held by the Guild of Fine Foods )- has proved a huge success since its release and really set’s itself apart from others on the market, an essential addition to any stew or casserole and very simple to use. Made with Amko’s shredded beef suet. Amko Yorkshire Pudding Mix is additive free and made with carefully sourced ingredients. It’s simple to use and an excellent accompaniment to Sunday roast. Amko Suet Crust Pastry Mix give’s any traditional Hot Pot or Potato Hash a delicious light fluffy topping which you will find hard to beat. Amko Pancake Mix our range would not be complete without a traditional Pancake Mix, ideal for sweet or savoury dishes. Amko Batter Mix is versatile for both sweet & savoury dishes, a light crispy batter – ideal for fish, or banana or pineapple fritters. Amko Crisp & Crunch Mix is ideal for use on succulent pieces of chicken to give a great fried chicken coating. Amko Cheese Sauce Mix this ‘NO Lumps’ Cheese Sauce Mix gives the best results every time, perfect for Lasagne, or use as a ‘pour over’ sauce for ham or cauliflower. This is a real cheesy sauce and not for the faint hearted. Amko Doughball Mix a versatile, easy to use mix with no additive’s, great results every time, no stew or casserole is complete without it. NEW Amko Vegetarian Dumpling Mix – a new addition to the range – made with Amko Vegetable Suet (Palm Oil)- Ideal for Casseroles, Stews and Soups. A fantastic dumpling mix you will find very hard to beat. NEW Amko Vegetarian Suet Crust Pastry Mix – Made with Amko Vegetable Suet (Palm Oil). Ideal for making Hot or Cold Crust Pastry for topping off casseroles. Give it a milk wash to brown the crust to a delicious golden crust pastryyou will find hard to beat. NEW Amko Vegetarian Pastry Mix – Made with Amko Vegetable Suet (Palm Oil)- Ideal for making plain pastry for any homemade pie, or cheese & onion quiche. Amko Sage & Onion Stuffing Mix made with the finest dried sage, kibbled onions and a few secret herbs, give this stuffing an unmistakable taste. Amko Parsley & Thyme Stuffing Mix made using the best ingredient’s giving it a distinctive taste. Ideal for chicken or turkey. Amko Apple & Herb Stuffing Mix a unique flavour and a popular accompaniment for chicken or pork. 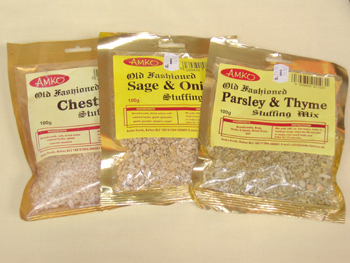 Amko Garlic & Herb Stuffing Mix a mild garlic stuffing combined with a select range of the finest herbs. Amko Chestnut Stuffing Mix has proved to be a popular year round choice, since it’s launch, perfect with chicken and turkey.